Welcome to the fascinating world of the passion fruit! When you think of fruit, what usually comes to mind? My guess would be apples, oranges, or strawberries. But on this site, you will find out tons of information on a fruit you may have never even heard of, the delicious and nutritious passion fruit! Passiflora edulis is the scientific name for the passion fruit. There are two types of passion fruit, ranging in color from dark purple with small white specks (the standard purple passion fruit, P. edulis Sims) to a light yellow hue (the yellow passion fruit, P. edulis f. flavicarpa). 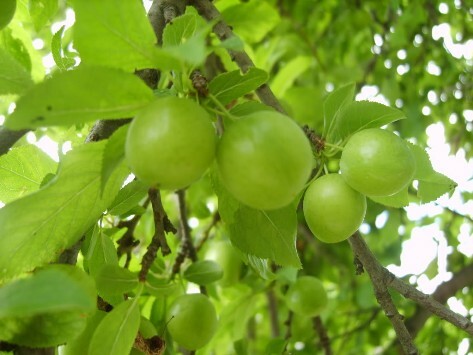 These edible fruits contain a tough outer waxy covering and can range in size from 1.5-3 inches in width. By opening the passion fruit up, you will find that there is an array of sacs, which consist of a sweet to tart flavored pulp, and up to as many as 250 dark seeds! Now that you should be able to identify a passion fruit based on its morphology, let's take a look at how it is classified, by going to classification. Want more? Check out the diversity of organisms we eat every day by going to MultipleOrganisms.net, a larger project done by the University of Wisconsin-La Crosse to which this website is a part of.